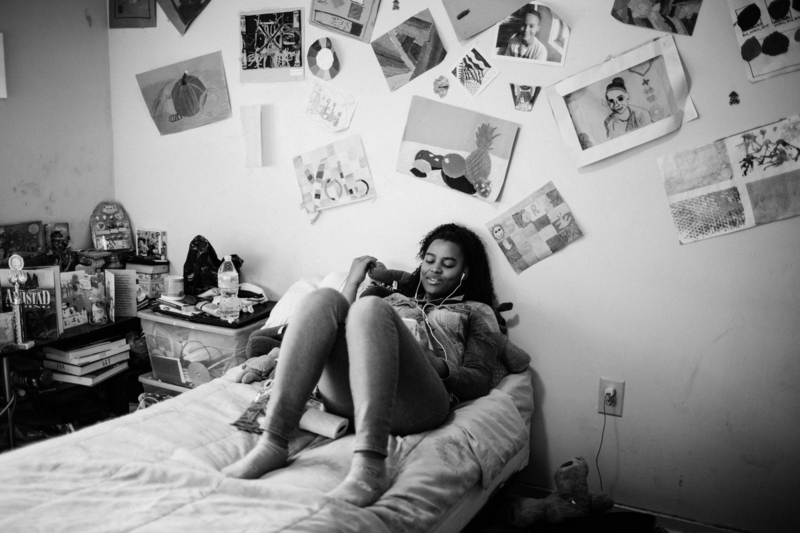 As A D.C. Public Housing Complex Faces Redevelopment, One Teenager Reflects : The Picture Show Eighteen-year-old Dasani Watkins and her family moved out of Barry Farm in May 2018. She talks about her time there, as the community prepares for redevelopment. 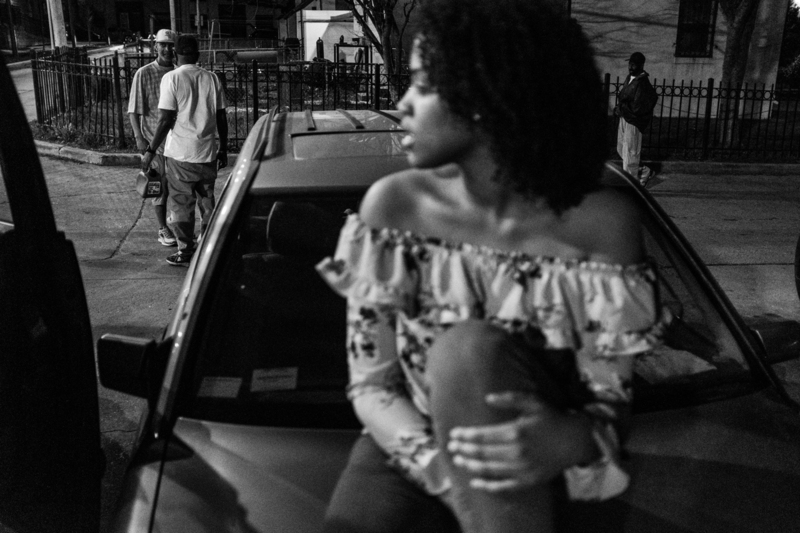 Dasani Watkins sits in front of her Barry Farm home before the first day of her senior year in 2017. Watkins moved to Barry Farm with her family in 2013. 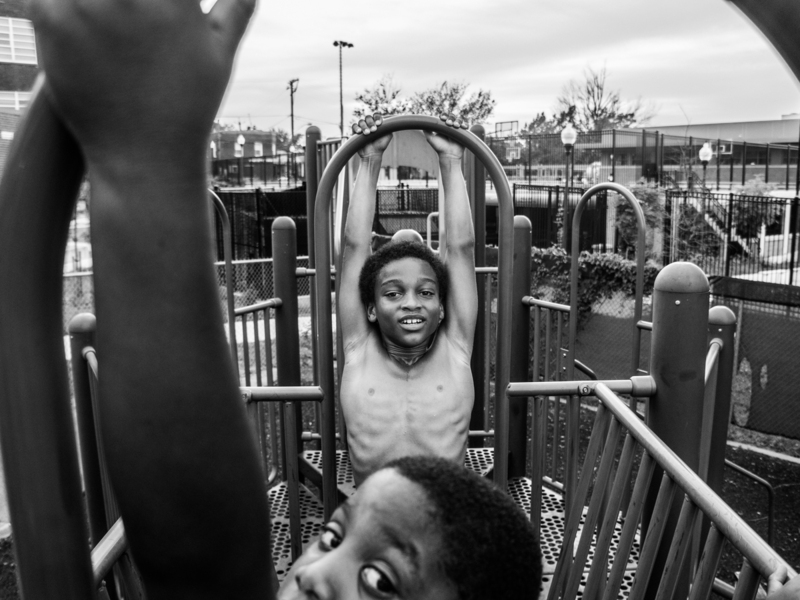 In 2016, photographer Joy Sharon Yi began taking the Metro to Barry Farm, a large public housing complex in Southeast Washington, D.C., built in 1943 on the first city settlement where African-Americans could buy property and build homes after the Civil War. Chase Marshall, Dylan Marshall and Zion Archer play in the complex's yard in 2016. Chase and Dylan are Watkins' brothers. 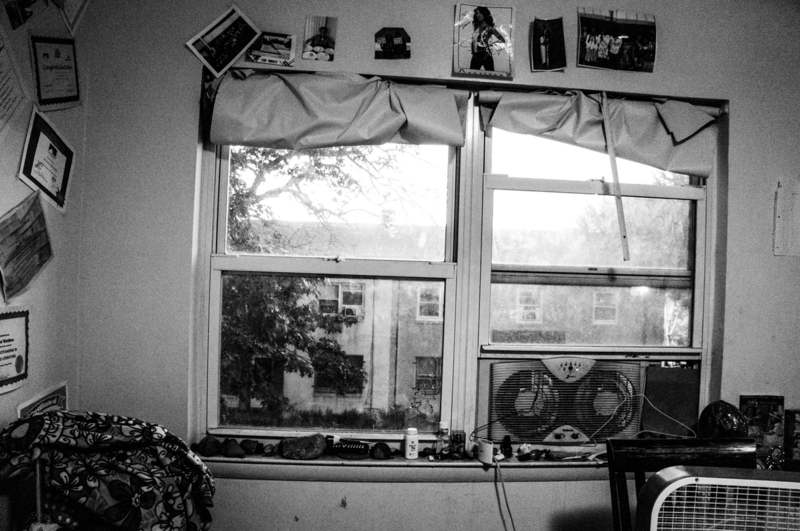 Yi was drawn to Barry Farm's history and the looming shadow of change. She spent time getting to know residents at the famed Goodman League basketball games and eventually began documenting the community. 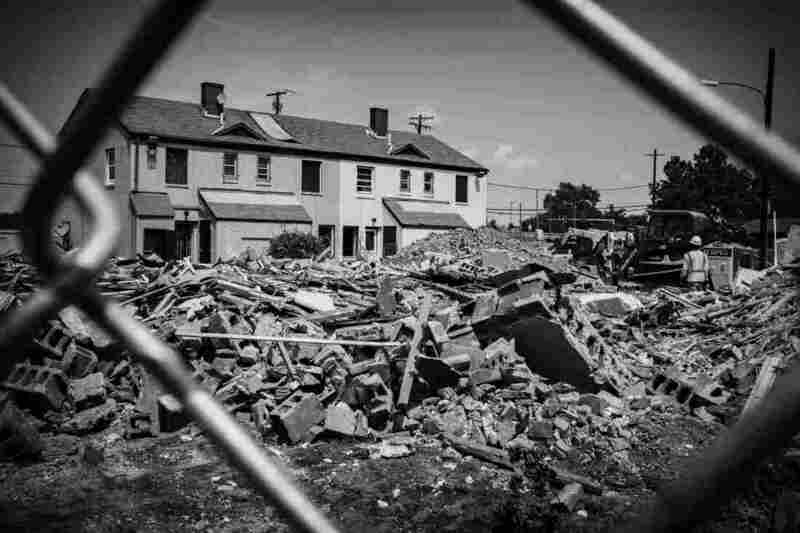 At that time, "Barry Farm residents ... feared being displaced, but the community was not yet on its last legs," Yi says. "Residents [and] former residents really, genuinely loved their community. I wanted to document that joy before the buildings came down." 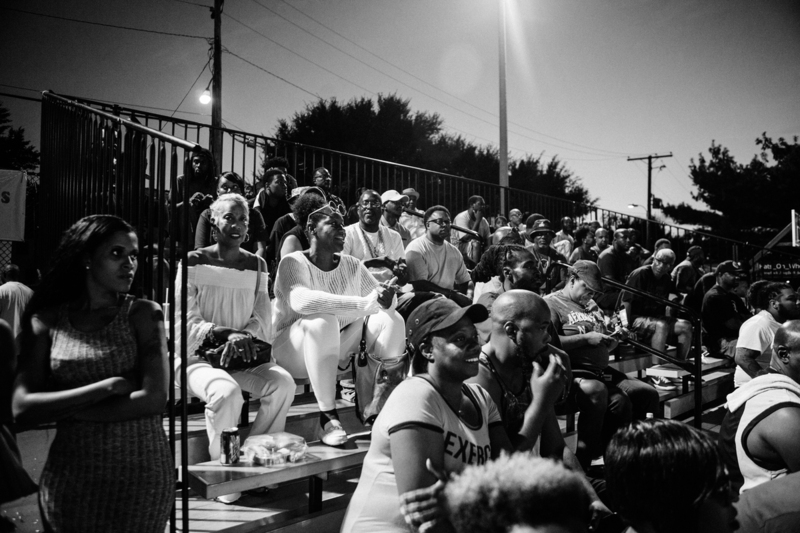 A crowd watches a Goodman League basketball game at the Barry Farm Recreation Center in 2016. The well-known basketball league plays regularly throughout the summer, and games can include everyone from former NBA players to high school students. In 2005, the District government launched the New Communities Initiative — a plan to redevelop the 444 units at Barry Farm into a mixed-use, mixed-income community, which officials say would have space for former Barry Farm residents. Over a decade later the program has yet to be realized at Barry Farm, facing delays, setbacks and criticism. 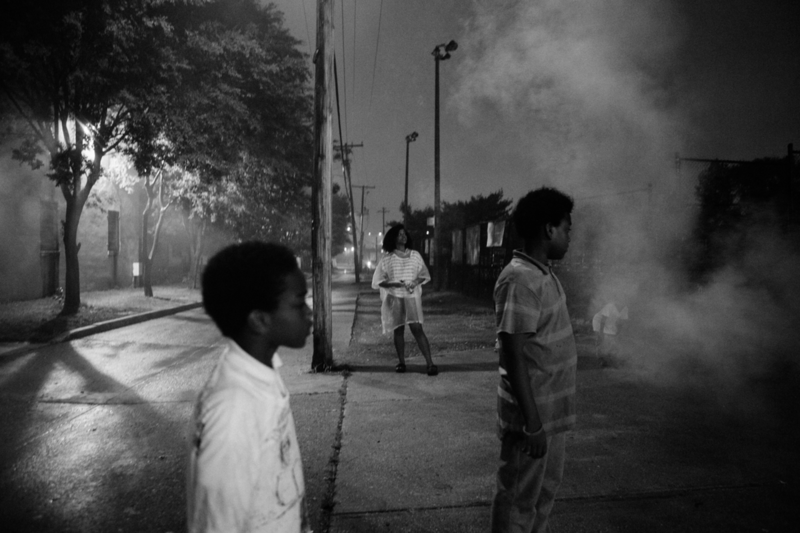 Yi used black-and-white images to connect Barry Farm residents to the city's history. "The more I researched Barry Farms, urban renewal and the historical use of black-and-white imagery in America, particularly in low-income communities," she says, "at a certain point, I started to recognize history repeating itself — enduring trauma and the repeated, forced displacement of black communities." (Left) Writing on a former tenant's wall after the apartment was vacated in February. (Right) A mattress on Eaton Road in 2018. Barry Farm Public Housing Complex is one of four communities set to be redeveloped into mixed-income housing under the 2005 New Communities Initiative. Her relaxed, documentary-style photos captured quiet details and casual moments. "I personally think that not enough is being told about what is happening in terms of the affordable housing crisis," she says. Yi hopes her photographs "add something to the conversation in terms of people being able to see who lives here." 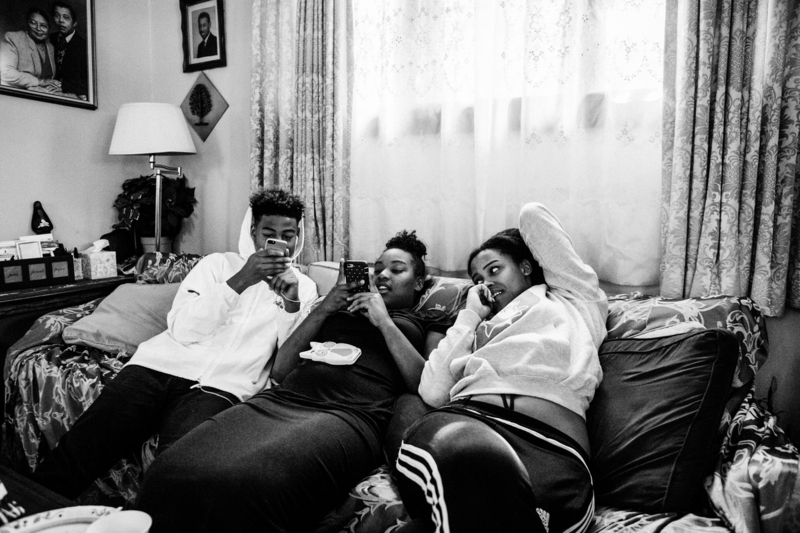 Dasani Watkins relaxes with her siblings Devon Marshall and Elizabeth Marshall in 2017. The majority of residents have since relocated — some to different public housing, others with the help of vouchers. "One of the residents told me, he said, 'It's a ghost town basically now,' " says Yi. "When I first came in 2016 there were a lot of kids ... people of all ages hanging out." That's less true now: "The Housing Authority has boarded up the houses, a lot of them," she says. The view from Watkins' bedroom at Barry Farm, partially blocked by a window fan. Watkins says one of the hardest parts of living at Barry Farm was the lack of air conditioning. Though she photographed the community widely, Yi was especially drawn to the story of one resident, an ambitious teenager, Dasani Watkins, who was then a student at E.L. Haynes Public Charter School in Northwest D.C.
Watkins and her family moved out of Barry Farm to Brightwood Park in Northwest D.C. this past May with the help of a housing voucher from the District government. 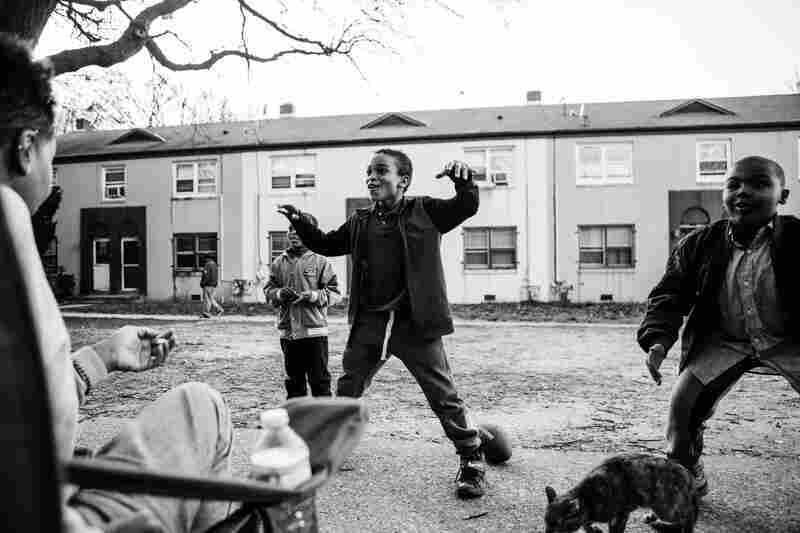 Here, we share excerpts from conversations between Watkins, Yi and NPR's Becky Harlan about what Watkins learned growing up in the projects, how it felt to leave and what it means to have your community disperse. Watkins video chats with a friend from her bedroom in Barry Farm in 2016. Watkins moved to Barry Farm with her family in 2013. "I thought this was the worst place in the world, and I could not believe my mom would bring us to this 'hood," she said, "but I was excited to have my own room." Note: This interview has been edited for length and clarity. Colloquially, Barry Farm is referred to as both Barry Farm and Barry Farms. Joy Yi: Tell me about some of the circumstances that brought you to Barry Farm. Dasani Watkins: I was coming from Florida, and living with my cousins at the time, but we weren't able to live with them anymore. We were living in our van — we were homeless. We used to sell Gatorade on the street at Gallery Place [in Washington, D.C.]. I was only 11. That's when my childhood ended. Eventually we moved in with my aunt, and eventually she got us into public housing, and that's how we got into Barry Farms. Sean Brown, Chase Marshall, Dylan Marshall and Zion Archer play together on a hot summer day at Barry Farm in 2017. Yi: What was it like to grow up there? What was difficult? What were your favorite parts? Watkins: Growing up in Barry Farms is not as bad as many may think it is. 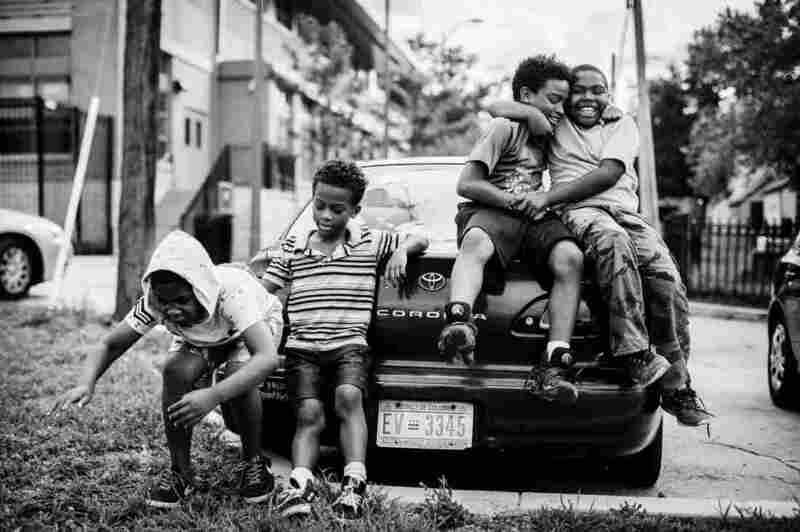 It's hard to grow up in the 'hood, but I don't want to put a bad image on Barry Farms or the people who are there. It's a good community. People tend to talk to each other more than in my new neighborhood [in Northwest D.C.]. The hardest part was the commute to my high school 30 minutes away. The summers were very hard because it was very hot, and there was no air conditioning. You would be sitting in the heat, 97 degrees, no air conditioning. Fourth of July is really fun over there — fireworks, there's a pool. It's a typical neighborhood; people do normal things. It's not just all violence. Dylan swings on a playground with his friend Sean Brown in 2016. Dylan Marshall, Dasani Watkins and Mason Marshall watch fireworks on the Fourth of July in 2016. Yi: How did it feel getting ready to leave Barry Farms? Watkins: It was a bittersweet feeling. Mostly because the community that I had there was really close. So it was pretty sad to leave, but I didn't want to live in public housing the rest of my life. And I guess getting away from the violence was good. [The new house] was also closer to my school. I can always go back to visit, but I fear one day I will go back, and it's not the same. Of course things are going to change, but like, is the change going to be good or bad? I guess it's the fear of the unknown. (Left) Watkins rests her head while at Duke University's Summer Program. (Right) Watkins chats with her friend at E.L. Haynes High School before going to Howard University for her graduation ceremony on June 16. Watkins graduated as salutatorian. Yi: Tell me a little bit about your school life. Tell me what you've accomplished and how important it was for you to have a place to go home to. Watkins: I graduated high school this year and I was salutatorian of my class. I got into eight of the 11 schools I [applied] to. I'm going to Pitzer College in California. Woot woot! Full ride! The thing that got me through high school was my drive to do better, and ... be something better so I could take that back to my community and spread that knowledge to everybody else so we all can grow and grow together. I think I wouldn't be the person I am today if I didn't go through the struggles that I went through because I would have nothing to fight for. I'm always going to be a fighter. People spend time together outside at Barry Farm in 2016. "Every day for me is chaos," says Elizabeth Marshall (center), Watkins' sister. "I love it." Yi: What other lessons did Barry Farm teach you? Watkins: It taught me to not judge a book by its cover. You can look at somebody and assume that person is vile, dirty, that they don't do nothing for themselves. But if you really look deeper, there's so many things that play a part into that person's oppression and depression. Talk to someone before you assume, and ask somebody if they want your help before you try to give it to them. I think that's what people are doing — they're trying to fix something, but they don't even know if it needs to be fixed. (Left) Paulette Matthews, a Barry Farm resident for over 20 years, is suing Washington, D.C., for alleged racist gentrification practices. "People don't even know people but because of their ZIP code. ... The thing is, sometimes in the deep trenches, there are so many rich diamonds," she says. (Right) A note informing guests of a sleeping baby hangs in a window. 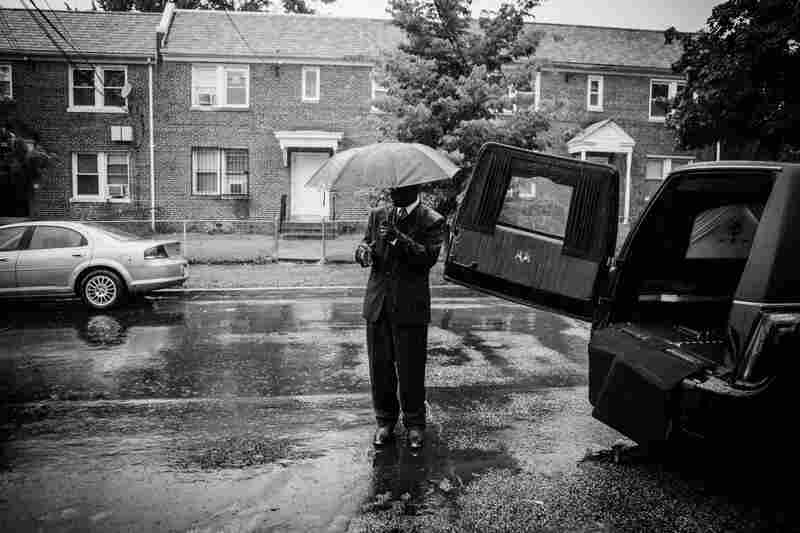 A man waits in the rain during the funeral of Milton Joseph Taylor in 2017. Taylor represented incarcerated people and was a well-known leader and friend in the Barry Farm community. Yi: Why do you think Barry Farms is important? Watkins: It's important because there are people there. It's a community. 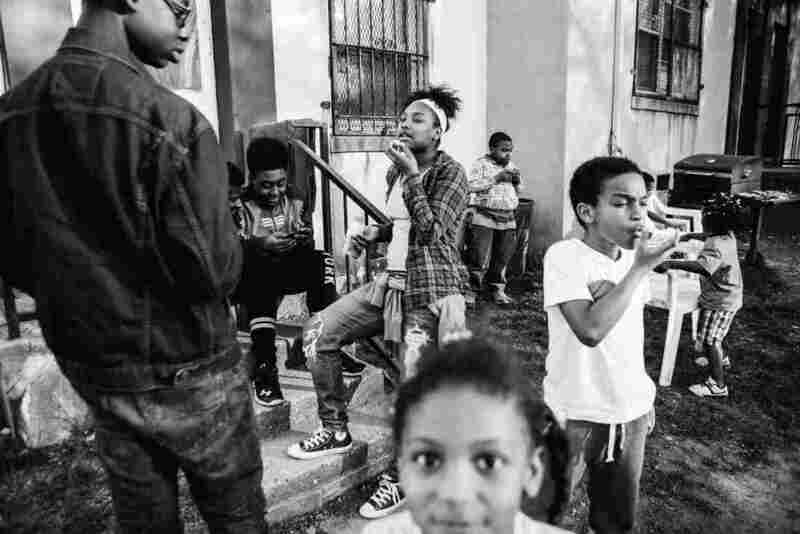 Children have grown up there, generations have grown up there, but do you really want to continue that type of oppression and depression inside of Barry Farms for generations? Yes, bring the change to the neighborhood, but bring it for those people. Don't push those people out and bring it for someone else. Rochelle Weary organizes her son's Boy Scout calendar in her Barry Farm home. 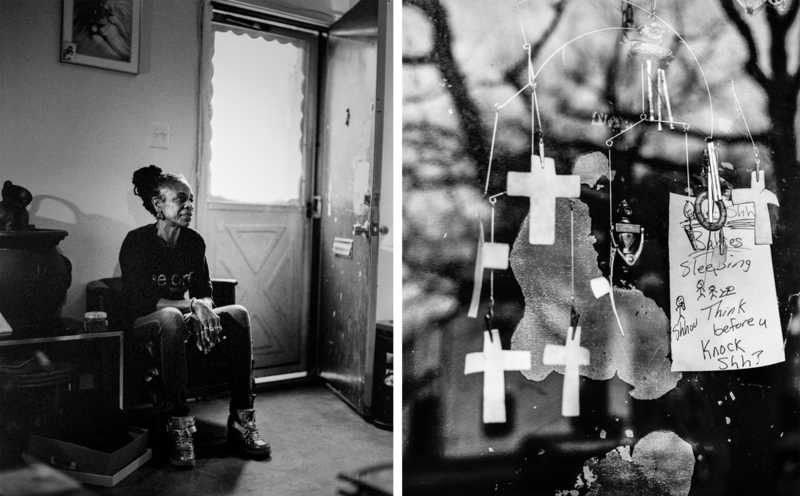 A born-and-raised Washingtonian, she endured the struggle of living in Barry Farm when Washington was considered the murder capital of America. Weary works at the Far Southeast Family Collaborative and supports her mother, brother and two children. Becky Harlan: When you moved, did you feel like you were saying goodbye? Watkins: It wasn't like a "see you later." It was like "goodbye" because you're not certain if you're ever going to see these people again. It's kind of sad — you grew up with them and now they're gone. They're going to different neighborhoods, and you don't know if you'll ever have that same community again. People don't talk to each other in [my] new neighborhood. They don't speak at all. In Barry Farms, it was, " 'Are you doing OK?' or 'Do you need help with this?' or 'Do you want to talk about it?' " Here, it's go about your business — you don't talk to me, I won't talk to you. 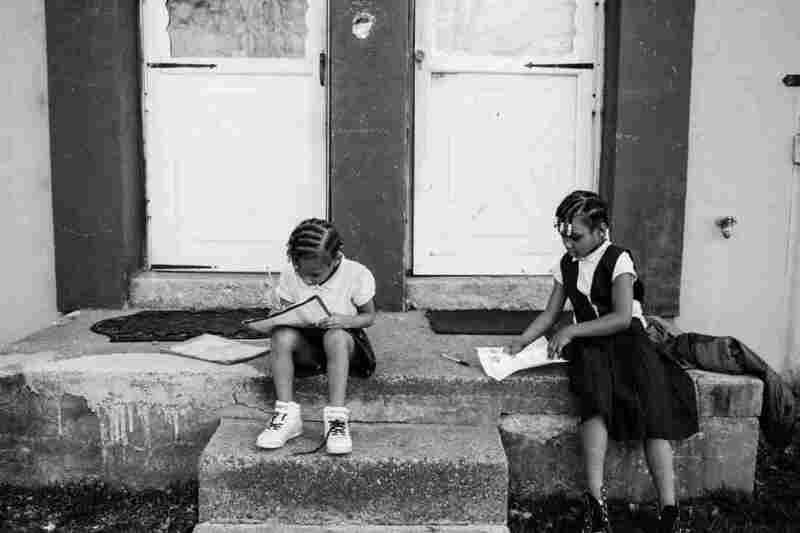 Amor Merlin and Lakeisha Merlin do homework outside their home in Barry Farm in 2016. 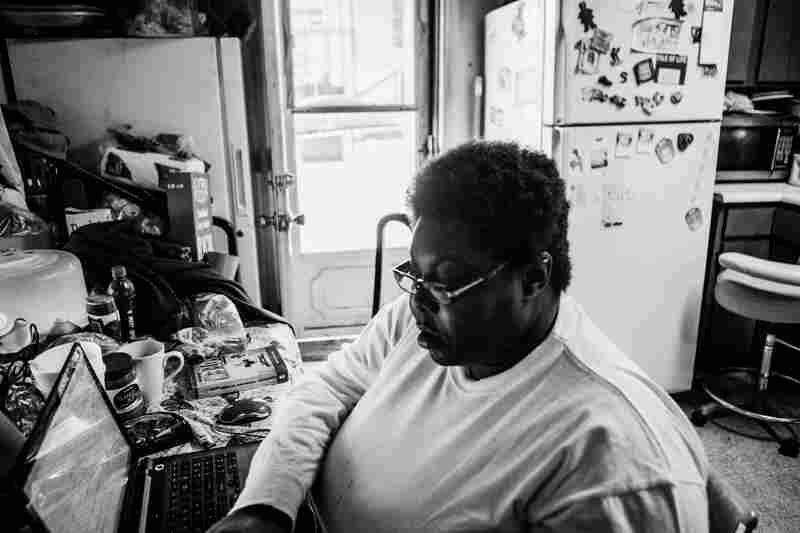 Harlan: Is there anything else you want to say about Barry Farms? Watkins sits on the hood of her mother's car in April. Watkins moved from Barry Farm to Northwest D.C. with her family in May. 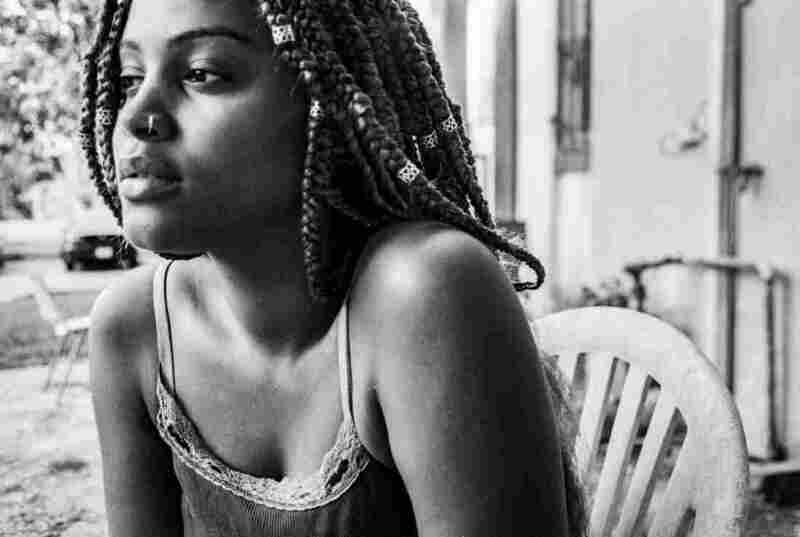 Joy Sharon Yi is a documentary photographer and video editor based in Washington, D.C.
Dasani Watkins began her freshman year at Pitzer College in September. This project received support from the Alexia Foundation.